On March 19, Carmen, who earlier led us on a thorough tour of “immigrant Malaga” brought us to Incide Organization on our walk around the immigrant neighborhood near Place de la Merced. “Incide” stands for Inclusion, ciudanio diversidad, y education. Incide has existed for 24 years in Malaga. There are 500 total employees, with 50 full-time. The focus of the organization is on Moroccan and African immigrant, many of whom work in Agriculture. For immigrants to be regularized in Spain, one needs to have been in Spain for at least 3 years and possess a job. Once one person has papers, they often want the rest of the family to also obtain papers. Incide helps immigrants do this, as well as working with minors who are on their on. The organization owns apartments in Malaga that migrants under 18 years of age can reside in. After we left the main office of Incide, Carmen continued our tour of the neighborhood and brought us to a preschool that Incide runs for children of immigrant. This was definitely the highlight of the tour for many, as the children were so energetic and happy to see us. It is clear how much the employers of Incide care about immigrants and their families by observing how they interact with the children in the nursery. After the nursery we stopped back at the barber shop where her friend Mounir works. Mounir was very close in age to us, so it was especially impressive to hear his story. 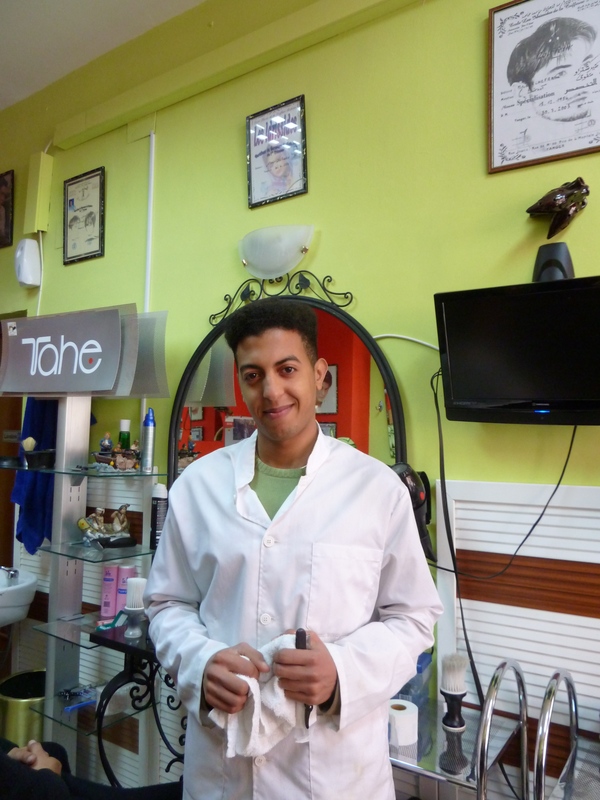 He got his degree in Tangier but left Morocco at age 20 to find a better future. He entered Spain by stowing away underneath a truck. The first place he went was Barcelona, where he found work as a barber. Soon he went to Sevilla and obtain papers. Eventually he made his way down to Malaga. He first found work by making house calls as a barber. He eventually worked his way up and now owns his own shop, a pretty impressive feat. Since so often we hear stories of struggle and despair for immigrants in Spain, it was inspiring to hear about the success Mounir was fortunate to achieve. This entry was posted in Mosaic. Bookmark the permalink.